This Panera Bread Chipotle chicken panini sandwich is so good! 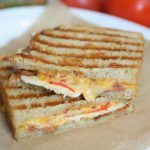 Sourdough bread slices are smeared with an amazing smokey chipotle sauce then layered with some tender chicken breast pieces, hickory smoked bacon slices, tomatoes and a cheddar cheese blend. The spread for this sandwich is what makes these sandwiches taste amazing, I’ve tried buying the ready sauces that seemed to have been it, but none matched the smokey sauce that Panera served. Panera’s was a deeper orangey red shade and had whole grain mustard seeds in there spread. It was smokey, tangy and just so delicious. After buying a few different sauces I decided to play around with the different combinations until I got something to taste like there version. After making this sandwich I was convinced this was so close to the original (unfortunately I wasn’t able to compare since they don’t carry that sandwich) but I highly recommend you trying this version. All the ingredients create an amazing melody of flavors with ingredients you can find in most grocery stores. 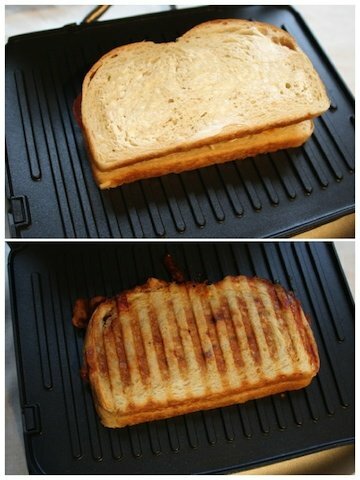 If you don’t have a panini maker (I highly advise one) you can use a plain non-stick skillet for this recipe. Enjoy! Season chicken breast with salt and pepper to taste. Bring a medium sized saucepan half way filled with water to a boil; add chicken breast and simmer over medium heat for 20 min. Remove, and thinly slice. 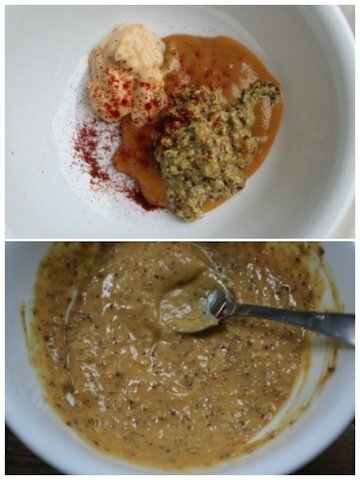 Combine 6 teaspoons of stone ground mustard, 6 teaspoons of sweet hot mustard and 3 teaspoons of chipotle mayo. Add a few pinches of paprika; stir well. 3. Spread 1 teaspoon of the chipotle sauce over each slice of bread. 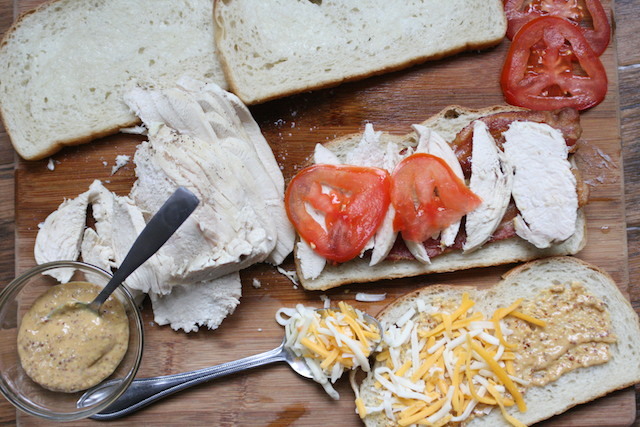 Top with bacon, chicken breast pieces, sliced tomatoes, 2 tbsp shredded cheese. 4. Spread 1/2 a tbsp of soft butter over the outside of each piece of bread and cook in the panini press until cheese melts. 5. Remove sandwich slice in half and serve! Enjoy! Spread 1 teaspoon of the chipotle sauce over each slice of bread. 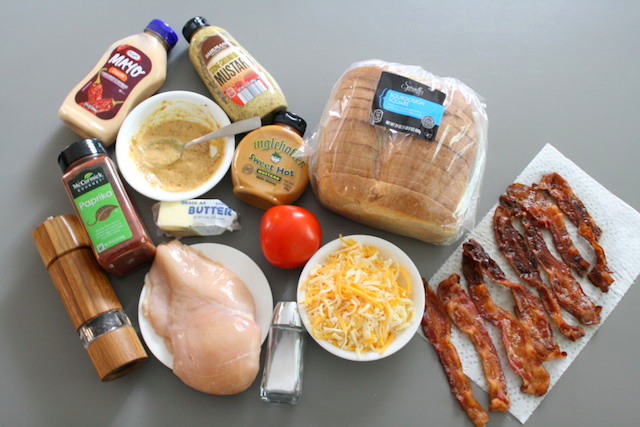 Top with bacon, chicken breast pieces, sliced tomatoes, 2 tbsp shredded cheese. Spread 1/2 a tbsp of soft butter over the outside of each piece of bread and cook in the panini press until cheese melts. yummy sandwich but certainly not the Panera chipotle sandwich. This was more of a honey mustard flavor than chipotle. Ken, I didn’t really find this sauce to have an overpowering honey flavor, was there perhaps a different kind of sweet mustard that you used? Unfortunately Panera doesn’t have this sandwich on their menu anymore to compare, but I did think this was very close as far as I remember there sauce.